UK Motorbike Forum : This motorbike site doesn’t need a bloody tag line. I always leave mine unpainted, spills aren't a bother and the dust can be swept over them to soak them up some. Genuine question - in what way? In terms of keeping dust down and much easier on knees and feet. I spend a lot of time in there working - it makes a huge difference. I've sealed the walls and the floor ... even so the temp is rarely more than 2-3 degrees higher than outside temp. But then the 'heat' is going out of the roof which is just wood / bitumen / felt tiles... I don't mind too much as it means condensation, etc. isn't too much of an issue. But since the carpet has gone down (2yrs ago) I've noticed it doesn't get damp anymore in there... saying that around the same time I had the electric roller door installed so it might just be sealing better from the elements. I'm hopefully moving house in a few weeks and it has a double garage that probably has a damp problem. I suspect this is because it is slightly lower than the ground at the back and the sides. I didn't see any sign of damp in there but there's a gulley along the back wall leading to a drainaway. I plan to build a lean to against the back wall which should solve the surface water issue which is I suspect the main culprit. The side walls are party walls but buildings on both sides sit about a foot higher. My question is what benefit or problem is painting the floor and walls going to give me, any suggestions? So to be clear, there is no damp but you think there will be? How old is the garage? pretty sure mines got a damp course. I'd be chakc it out properly before doing anything. What did the Survey say? Have you exchanged contracts? White walls... Industrial carpet tiles in mine. The flooring makes a HUGE difference. 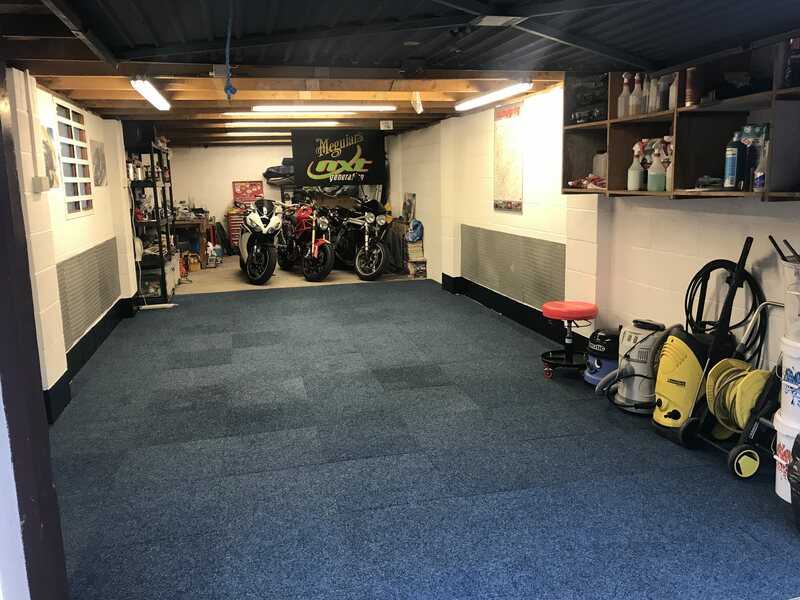 Totally agree with the flooring, I have a fair few of the rubber backed/ edged entrance type mats on my garage floor, which is tiled so bloody freezing and rock hard when bare. They are about £30 each from Ebay. But suit me as I can move them around as needed and just had a major oil spillage so threw 2 out and just replaced them with 2 new ones. The structural survey said pretty much what I thought that there was no sign of damp but the drain gulley at the back indicates there's a problem. The garage was built about 1970 and any problem is likely because the sides and back are slightly below ground level, in particular the patio at the back. I plan to put a lean-to on the back and a roller door in the wall so, if water still comes under the door I'll need to improve drainage. What I will do is wait a while before doing anything to check where any water is coming in, it will make painting more awkward but I'd rather not move any problem elsewhere especially into the house. Exchange should be this week, the garage is not enough of a problem to put me off as there are very few properties that tick the right boxes. Now I own the place and we've had plenty of rain I found a little water is seeping in below ground level at the back. For now I won't do anything until I've built the lean-to behind the garage, I'm tempted to build a small extension to the garage but I think my wife would have a fit as it would mean the lounge door goes to the garage rather than the patio.